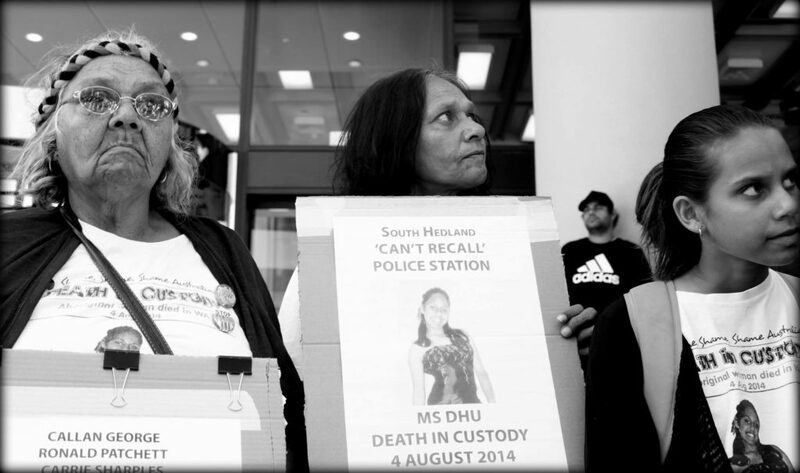 The inquest into Ms Dhu’s death was initially intended to be held at the South Hedland Courthouse, but was later relocated to Perth. This move diminished the capacity of Ms Dhu’s immediate family and community to attend court and to bear witness to the coronial process. The inquest was scheduled to hear testimony from 38 witnesses within a 10 day period between 23 November – 4 December 2015. Following the conclusion of the medical witnesses the inquest was adjourned until March 2016. This put further strain on Ms Dhu’s family. Throughout the inquest, Ms Dhu’s family and highly respected Nyoongar Elders were treated with disrespect. Day one of the inquest set the tone of the proceedings with an interrogation of the family. When police and medical witnesses were questioned they frequently responded with ‘I can’t recall’ which provoked frustration from the public gallery. Some medical and police officers offered contrived apologies in court, causing pain and offence. Objections and responses from the public gallery where the family sat were consistently met with a disciplinary approach. Elders were threatened and patronised.